June 3, 2007 06:24 - Hasn't got better yet... but it's close! .... it BETTER be! The only thing I hate worse than painting ... is moving. At least when you're 'moving' a house. Especially making the transition from a house to Full-Time in a fifth wheel RV. The end result will be a sweet life for sure, but getting there is an ordeal! Funny how 'moving a house' and moving in a fifth wheel are to TOTALLY different things! I've held it together this long.... I only need to tough it out for a few more days and the world around me should slow down a good deal! If it don't.... this Ol' Cowboy is gonna snap in two! Sorting out the collection of near 30 years is a job. Then we go and get it compressed into just a few days. Leave it to me to make it as difficult as I can! I've said it before, but it stays true. Even when you aren't really motivated by possessions, it's difficult to part with a lot of what you have. Maybe it comes, a little, from being pretty poor back there on the ranch. Could be I put more value on them 'possibles' than I admit! The saving grace is that the biggest part of the furniture is staying with the house. I was dreading moving that 7' tall log bead! That sucker would make Paul Bunyan pop a hernia.... when we bought it, we were still living on the ranch. I had to use the end loader to take it off the truck!.... that's when we found out it was too big to fit into the cabin! Couldn't get it through the bedroom door.... OOPS! 5 days and we have to be clear of here... though we have to stay in town 'till into September for various reasons. The bow strings are gettin' tighter an' tighter! I think, once we get gone from here we may have to take at least a few days and take a short trip up into the hills to cool out! Hauled most of the boxes to the storage shed yesterday. Have to move the few furniture pieces that are moving today. Josh, my recently acquired son... heh heh heh.... he didn't know he'd been acquired!.... Any way, he sold my shop tools, at least the big ones, so I hauled them to Denver last night. Got home at midnight. still have one more 'big' one to take down. I've got this shed rented for a month. That will give us time to make a final sort and discard effort, at our liesure! I'm hoping now, to get it cut down to a small stack that we can go ahead and take advantage of a friends offer of a corner of her basement. Have to get a quick, temporary, P.O. box set up today or tomorrow, as well as get all the utilities changed out, the septic pumped, the phone scheduled for disconnect, the propane measured, the last of the junk packed, stuffed or dumped, mow the grass ONE LAST TIME! 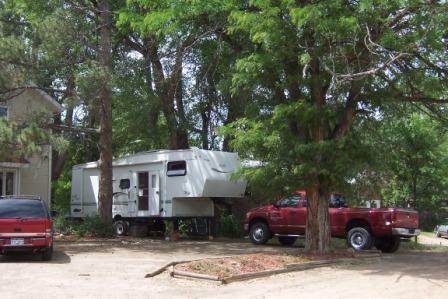 and find a place to park the brand spanking 6 year old NEW RV FULL-TIMER Eagle somewhere! I need to find a new lid for the septic tank.... it seems some short brained, bowlegged, gear jammin' geezer ran the tractor across the shallow buried tank lid, a mite too many times, and cracked one! Wasn't me I swear! I never do nuthin' incorrect! While I'm not doing all that I need to tear the door frame out of the shop, while I'm hoping my measurements are accurate, so I can move my big 'clicker' to the storage shed for, hopefully, a short while. It's a 4,000 lb, hydraulic gyzmo you use to cut out parts, when you need a lot of 'em. Makes things go quick in a shop, but it has a pretty awful narrow market when you try to sell an old one. I've tried to 'almost' give it away, without success.... hard for me to do with a machine still worth maybe $2,500.... But I would REALLY rather not store the thing. I'm done with her and just need a good home for it.... patience Brian. Then... I walk in the fiver yesterday, and I swear I smell MOUSE! Yeeeeeiiiiiiiiiiiiah! We've not had any mice in over two years. Ever since I spent the better part of three days stripping the belly, cleaning and then totally sealing it all up tight. We'd had a bad infestation and I thought I'd cured it. I searched for an hour and can find not a single departed critter, but I swear I can smell one.... scattered more Bounce dryer sheets. Guess I got lazy and careless and didn't change them out recently enough. They've always worked well as a repellant, and at least they perfume the place so I can't smell that 'other' smell. Well, it ain't gonna get done with me sittin' here suckin' on a coffee cup and bangin' on the keyboard so I better get after it. If you hear a loud SNAP! POW! BWANG!!!! ... You'll know what happened to the 'bow string'. June 7, 2007 23:35 - We're close to Full-time now... But I won't call it 'The Leaving' yet! The part I've been dreading most was moving my 'clicker' out of the shop. I had to take out the door frame when I brought it in... so I figured I'd have to take it out again to move it back out... I was right! I wasn't completely sure it would fit into the storage space we rented. Luckily it did, so, for the time being that's one worry off my hollow noggin'. Plugged carburetor on one, burnt brushes on another saw... couple little warts like that. He hasn't complained yet so I guess it must not be a big deal... there's enough good stuff to make up for them that are less than shiny I guess! Heidi found a spot to park the rig for up to a couple months. A customer of hers, at our store, has a Full RV hookup they put in at their house, for when her brother visits. I guess he comes in the winter for a couple months... visits Colorado in the winter for a couple months? In the Winter? In his RV? I wonder if his GPS or his Calendar is broke? Anyway, the price is pretty cheap and it'll be convenient to both the store and an agility field for Heidi and Buck to practice on. We'll give it a go for at least a little while. Since there are wheels on our RV Home... we can pull it down the road if we decide we don't like the neighborhood! In the mean time, it will be pretty cheap living while we wait for the completion of our 'deal'. We have some final clean up details to take care of around here... and then I'll move the rig over there, probably Sunday evening. For a while, I'll have to either, go to our store, (The Bead Cache in Fort Collins) or down the road to Mickey D's, to do my posts, and other work. I've made fresh contact with Bill Adams at Internet Anywhere. As soon as the house deal closes we'll work out the final schedule for meeting up for our Datastorm satellite installation, and then I'll be ready to run with the Big Dogs! So... I suppose Mickey D's may win a lot of business from me. There ain't no coffee pot in our store! I should have known there was something wrong with Heidi when I met her. Not drinking coffee can't be good for a person! Like I said, though we'll be moving into Eagle the Fifth Wheel, and off the home place, the Official 'Leaving' won't happen until after we close on the house. We have to button up some business dealings that have to wait on the house closing, before that Big Red Dodge Cummins can actually pull us down the road in pursuit of our long awaited Yondering Adventure. All the furniture that is going... is gone. Heidi is going to the 'yard sale' today. Since our place is pretty far out of town by 'townie' standards, we figured a yard sale here would get little attention. A friend lives in a neighborhood that has an annual 'community' yard sale. She offered to let us bring our recycled 'treasures' to her place for the sale, and we took her up on it. Hopefully, today will be the day we find out some of our possessions are long lost collectors items and there will be a bidding war... yeah.... right! I have to go to the hardware store and sell nuts and bolts. Really poor timing for that place to be too short handed to get the day off, so I can finish up here. Mostly swamping out the dregs of trash and junk that accumulates when you move. I will be glad when the next couple days are done and gone and the pressure is gone with 'em! Be nice to just stop to take a breath! At least the weather is purty. The mountains are clear and snow capped this morning. We'll soon be wandering amongst 'em. Only a couple months of waiting left to 'closing' and we are Yondering! It's probably a good thing we'll have that time. It will give us (me) time to get my head back in the right place. It's gotten a mite dislocated the past few months with all the commotion that goes along with selling a property. I don't expect to have much difficulty getting it screwed back on correctly though. Time to go make the donuts.... and sell our 'possibles'. You have a good one today, OK? June 10, 2007 06:26 - Tonight is the first night of the rest of our RV Boondocking life! Yep. Today is the day! We'll sleep in the Eagle tonight... wherever she's parked! The kids are coming up this morning to pick up their 'New' mattress, and help Heidi button up the 'swamping out' of the house. When I get off from the hardware store I'll hitch up and we'll head over... I think... to the RV Hookup that's been offered to us. Are you as tired of reading about this move as I am of doin' it? :-) I guess you have to go up the bumpy road to get to the best boondocking camps, so it's all for the best... but it isn't something I want to do again! One time will suit me just fine. I will miss that view of the snow capped mountains from the deck in the early mornings, with the whip-or-wills calling. The way the grass rolls in the wind like the waves on the ocean. The small horse herd skylined against the mountains, on the ridge to the west. I'll miss my big shop. That may be the hardest part to leave. Having the space and the tools to fabricate anything I needed. The thing that makes it all 'ride', is thinking, as I am gazing at those mountain peaks, that soon, very, very, soon, we will be wandering around in mountains even more beautiful, and maybe that I haven't even ever seen before... or in a long while. Thinking that we'll be seeing all sorts of things, fresh and new to us. If I am going to get to those RV Boondocking camps I keep talking about, I better shut my yap and get to the last chores around here! Posts over the next few days are likely to be kind of spotty. I have to find someplace relatively convenient to get hooked up, until I can get the datastorm installed... I can't wait for that to happen! ... Dang, seems like I'm always anticipating something don't it? Guess I'm always restless about something... those gypsy feet again, I expect! We finally made it off the old home place. Initially, we thought we could get it done Monday night. We thought wrong. I kept looking at the 'junk' pile and it started to remind me of Mary Poppins. Remember when she pulled all that furniture and such out of her carpet bag... like some kind of magic? Our bed left Sunday night so we moved into the Eagle then. But we had to remain on the place for a couple more days. I'd look at the 'junk' pile and figure I had a couple hours of work left. I'd haul load after load and take another look at the junk pile and I swear it didn't seem to be shrinking! Heck, once or twice I thought I was even losing ground. What use do we have for so much crap anyway! I never would have believed I'd accumulated so much. I'll darn sure make certain that mistake don't happen ever again! We're parked now at the home of a customer of our store in Fort Collins. They put an RV hookup in for a relative that visits every fall, and offered it to us for a very fair price. So... with a full hookup, Boondocking we ain't.... This, our first camp as full-timers, is still a little different than the home place out on the plains ain't it? I'll say this. Sitting in the shade under those trees, on the steps of the rig, with a soda, watching the birds, to the sound of the waterfall in the backyard is mighty pleasant, Boondocking or not. Especially when there's no more junk to load and haul. Assuming there are no 'issues' that turn the deal into a train wreck we can start yondering, we think, in September. This afternoon, as we were thinking everything was goin' good, we got a call from our agent. The last day before the title work deadline, a mining claim dating from something like 1903 turned up. It's only an issue now because of the big boom in Uranium the last year or so. I would guess the liklihood of anyone being able to do much urianium mining in a rapidly growing area is pretty low. But it sure helps keep my blood pressure from declining. We don't think it will wreck the train, but it's sure put a twist in my shorts! I just keep putting one foot in front of the other until this ordeal is over.... though there seems to be a lot of 'blue smoke' around me. All the packing, selling, hauling, and dumping of the past couple weeks, has made something real clear for me. If very many other Americans are much like me, I can speak for more than just myself too... we got way to much crap! I'm in the mood for a bonfire... anybody got any marshmallows? Finding a place to get on line has been a mite of a hassle. My ISP has apparently had some major meltdown at the same time I needed to get on to do this post... TWANG! Can you feel how tight that bowstring is gettin' pulled? I just sent an e-mail to a reader where I commented about my internet situation. Now that we are out of the house, but still a while from closing, my internet access is to be a bit more difficult. I can't get the mucho dinero Datastorm equipment installed until I get the check from the real estate closing. So until then I have to rely for the most part on internet cafes'. That's where a little humor enters into things. When a mustachioed, bowlegged, busted up Ol' Bronc Stomper waddles in draggin' his laptop, the town folk seem to think they done seen a genuine, un-adulterated, double rectified Dinosaur! The only thing I can't do at the cafe', I suppose, is do any banking. I've been warned that your passwords and such are pretty vulnerable in that environment... so I better figure a way around THAT not so little obstruction. Runnin' out of battery power... so I'll go back to the rig and get it charged up... suppose I better buy another battery huh? It will be a week tomorrow since we spent our first night, sleeping in our good Jayco Eagle as official Full-Timers. I can't say I'm back in the 'groove' yet but I'm getting there. My head is starting to slow down and things are gradually getting back into a proper perspective. It's a lot like when I worked on the ranches. I had little that was mine. Just my saddle, a rifle and pistol or two, my warbag, a good dog and a good truck. Little to worry about, and the whole of the west to not worry about it in! I'm not back to that place yet, but I'm a comin'! We shoved way too much junk into the fiver in the rush to get clear of the house. When we accepted the offer, just after Memorial Day and had only ten days or so to get gone, we'd no idea what we'd stepped in! Or, no shade of an idea just how much useless junk we'd gathered in one place! We've spent a couple days culling out and digging out in the rig. Finding homes for things we really should carry and taking other stuff to that storage shed that already has too much crap stuffed in it. I've lucked into a buyer for that 'clicker' I was stuck with... big loss dollar wise... big relief crapola wise! :-) One less BIG piece of 'stuff' to worry about. I can feel the vise on my chest slowly releasing it's pressure with each passing day, and with the 'divesting' of each additional piece of useless junk! I spent most of the last two days writing on a couple projects I've been cooking up... Sitting here this morning, sipping my coffee, the Sons of the Pioneers (the originals!) on the stereo, the Sun (the one in the sky!) shining through the window, shining times are smiling on me! And... I'm a rustler again! Was a time, I rustled Mustangs in Nevada a time or two .... now I'm an internet Rustler! I bumped the wireless switch on the laptop and somebody close by has their router set up open. So I 'rustled' a few minutes to put this post on. Shame on me! An outlaw again! June 16, 2007 21:50 - What am I missing here? OK. I admit, I miss a few things here and there. I claim to be the smartest feller I know... but being perfect... I have to admit now and again, that ain't exactly true. BUT.... This... even I can't get a handle on. What in tarnashun are these folks thinking? or maybe better... how did they drive their cars and rigs this far... when they obviously left their brains in cold storage, in the fridge at home! Just up the street from our Urban camp, the city is rebuilding the road with one of those God Awful round-a-bouts. Just in front of the house where we're parked, blocking the road, is a concrete barrier, festooned with orange safety fencing. If you go to the intersection, maybe 2 tenths of a mile south, are two large orange signs. "ROAD CLOSED TO ALL TRAFFIC". You have to drive between the signs, one on either side, and can clearly see the concrete barricade, blocking the road up ahead. Under those signs is a large "DETOUR" sign and arrow. The big rigs have to pay careful attention to clear the signs. There is a constant parade of cars driving through the signs, with the barrier, clearly blocking the road in front of them... coming down here, and then getting mad because the road ... MERCY SAKES ALIVE! IT ACTUALLY IS CLOSED! Spinning around, squealing their tires and leaving. We had a woman this evening, arguing with a fella that lives across the street. She was sitting in the cab of a truck, hauling a big fiver, the concrete barrier just in front of them, prohibiting further progress... "But our GPS says it's just 1.4 miles ahead!" It was all I could do to not run over and tell her, "Throw 'er in gear Darlin' ! That big diesel will get you through! If your GPS can't see it, that concrete barricade can't REALLY BE THERE!" That fella across the road must have asked her 5 or 6 times. "Didn't you see the ROAD IS CLOSED TO ALL TRAFFIC sign?" All she could say was... "But our GPS says it's just 1.4 miles ahead!" Criminee! What part of, ROAD CLOSED ~ DETOUR and CONCRETE BARRIER do folks not understand? A guy yesterday, in a 40 foot diesel pusher pulling a toad told me as he nosed up to the concrete, trying to find his way through a road that ain't there... "But, I always go this way!" ... Huh? June 19, 2007 19:50 - I think I am gettin' used to this RV Full-Timer deal! But I have been getting chores done. When we first left the old place... we had to be out in such a hurry we just chucked a lot of things into the fiver we 'thought' we would want or need. The rig looked like a bomb went off and scattered our remaining possessions all over the place. We've slowly been getting the fifth wheel into shape. I got a couple of storage projects done that I'd been unable to get to when I still had all the mowing, and irrigating, and more mowing, and painting, and more mowing, and more irrigating and .... all the usual chores to do. I was going to build a page about a couple of them tonight... but my Kodak Camera battery has as little energy as I do so It'll have to wait until the sun comes up another day! It's nice and warm here along the front range... good thing this Urban Camp we've got is setting in the shade of such nice trees. If there is any breeze at all, it keeps things tolerable without turning on the air conditioner. I'm trying in my old age to cowboy up and not coddle myself with such luxuries! Got the dinero this morning for that big OL' Clicker I've been trying to sell. That thing was kind of like my history in Real Estate. I figure to get rich by going against conventional thought. I've purty near got 'Buying High and Selling Low' down to a science now! :-).... a few more losses and I'll have it perfected! Heidi is going to Utah this weekend for a Dog Agility Competition. We'd been planning on me going and taking The Eagle... but that place I still work, until the house closes, changed their minds. I guess they are worried the walls are going to cave in if I'm not there... You wouldn't think nuts and bolts were that critical would you? So this weekend I'll be batching it again... maybe I can get some leather stitched... or some more of these little chores done... It is really nice being able to focus on just that! With none of that mowing and 'other stuff' to deal with! I am going to get used to this right quick! Yes Sir! June 20, 2007 19:03 - Catastrophe on Top of Disaster! Coffee! There ain't no dang coffee... anywhere in this rig! Where is that gol' durn checklist... I'm movin' coffee right up there to position numero uno! How does anyone expect to RV Full-Time if they allow themselves to run out of coffee! What sort of a pilgrim is runnin' this show anyhow? Not so bad here, there's a few hundred pounds of beans just a couple miles down the road. But, when we're camped, back yonder, deep in the bush, miles from the Safeway, absolute catastrophe! So, Brenn hill is serenading me on the stereo, as I sip a cup of .... COKE! **** Now I'm back.... I fired up the Toshiba to rustle some more internet, and do this post when, apparently, the mouse died. Not being as literate with this machine as I might be, and having the mouse pad on it turned off, I was stuck. I figured there was a way to turn the mouse pad back on, but I ain't got any idea where the user manual is.... so I had to shut it down and go down to the Geeks at Best Buy to show me the right button to push.... geez! You know, I was talkin' about exterminating meeses in the rig only a week or so ago. You don't figure it heard me and misunderstood what kind of mice I was set on trappin' do ya? Why, I could imagine the stress of worryin' about whether it was next or not might could have been too much for it's tiny lil' electronic heart! While I was out trackin' down a fresh mouse, I stopped by the Home depot again and picked up a few hooks. We've got a lot more 'stuff' to put away now then we ever carried on even six week trips. Like my ball caps! I ain't got what some fellers have accumulated, and I did cull out a couple... though on our travels I expect to be able to replace them! But I still got several to hang somewhere. Up there over the door works pretty slick... and now they ain't scattered all over the furniture gettin' sat on and aggravatin' the senior partner of this organization. 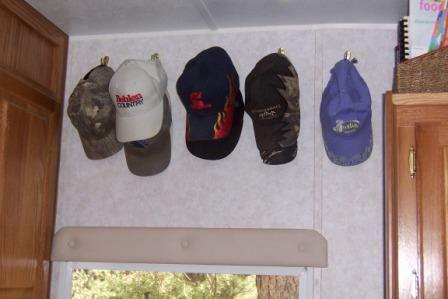 Also added some hooks in the bathroom for our bathrobes and a set of hooks on the kitchen cabinets, by the door for keys... only have the truck and fifth wheel now..... how come I got so many keyrings? Someday, when I'm feeling awful ambitious, I'll have to look into that! 'Til next time... remember to draw your coffee water.... upstream from the herd! You know, I'm as guilty of it as anybody. Maybe, I'm even worse. I got wandering eyes! Yep... only it's not the girls I watch... well, not all the time... it's the other rigs! Big fancy fivers with awsome MDT's pulling them, or even class eights. The fairly new Truck conversion rigs... sort of a class C on steroids! Diesel pushers.... You get the idea. I always seem to be looking for the next great thing. The point is this. The way I see it, This RV lifestyle is purty much like any of the others when it gets down to basics. It's a purty good bet that Ol' Donny Trump would be draggin' somewhat of a fancier rig than you'll find behind my truck! It's just life in the west. There is just no reason to get to feelin' low 'cause you can't afford the newest and best. Outside of Big Red, we couldn't either... and he stretched the budget juuuust a mite! If you do ever get to thinkin' such a way, do one of these things; Step outside your rig, where you're parked out in the woods, or down on the winter desert, or maybe you're up in a campground in Glacier National Park, and just look around. Think about all the poor buggers stuck back in Toledo, or Savannah, or even up in Yonkers that don't have the opportunity you do! Just look at how Shining your times truly are! Your rig keeps the wind and rain off. It keeps you warm and dry and takes you to uncounted memorable days. Think about the sights you enjoy every day, that many of them will never enjoy, and that humble rig that takes you there so well! Things are actually pretty dang good, ain't they?! Another thing you can do... is take an inventory of parts of your rig that don't quite work for you. Many times, with a fairly minor 'RV Renovation' project, you can mould your outfit to fit your needs some better! Over time, it gets to feeling like an old friend, and then you can't even think of tradin' her off for some shiny new whiz bang outfit! ... and think of the dinero you'll save reworking your rig, over buyin' a new one! You can sure buy a lot of high priced fuel, for the price of a new rig!... 'course, I'f you ain't already got a rig, why not? YOU, need to go get one! :-) ... before you miss any more LIVIN' ! .... end of another sermon! Keep your nose to the wind and the beer cold... and in the fridge until you park! June 22, 2007 21:08 - Some days are Diamonds! Heidi took Big Red and Buck and went to jammin' gears toward Salt Lake, first thing this morning. She and Buck have an agility trial there this weekend. Yours truly is stuck in Fort Collins. The hardware store decided it couldn't survive without me... They better hurry and squeeze out all they need real quick... as soon as that house closes all they're gonna see is tail lights! "Yo, idjit!.... ya you, ya bow legged little runt!... how do you figure your stuck?... ain't there a fine day, and a finer motorcycle outside that door?" All I could say was.... DOH! I am awful guilty of not listening to my own advice! So today I took some of it and took the day off! Fired up Slick, who was looking especially fine today after a bath and a polish yesterday, and headed out to run Poudre Canyon. Just up north west of Fort Collins, the Poudre River comes out of the mountains. 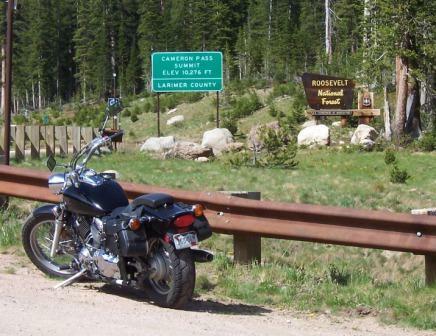 It starts up in Rocky Mountain National Park and comes down through the canyon named after it. 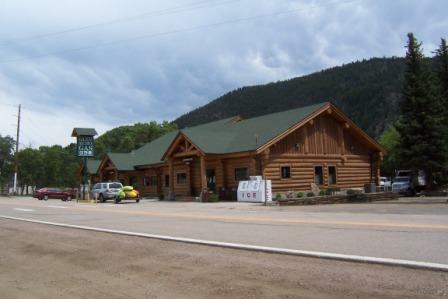 About 30 miles up the canyon at a little place called Rustic is Glen Echo Resort... restraunt, gift shop, RV park etc. Stopped there for lunch and to let a storm pass. Then on up the canyon. It's a beautiful place. Lots of twists and turns through the pines. A sweet ride on a good motorcycle. A fine drive in a toad as well. Lots of campgrounds along the way. The singing of the river makes a man sleep deep at night. I was following a dually pulling a travel trailer for a few miles... came around a sweeper bend and the truck and trailer did some jumpin' and bumpin, and out from under the trailer came a couple pieces of splintered lumber they'd run over. It was spinnin' all over the road! Uh OH!... Grabbed a tight hold and hit that crap doin' around 55 mph. Ol' Slick jumped it pretty good... raised my pulse a little though! 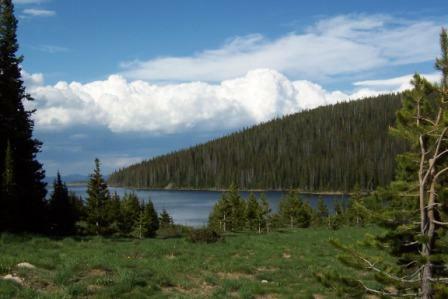 Up toward the western end of the Poudre Canyon is Joe Wright Reservoir. Can you imagine a prettier place? Trout fishing and fine scenery... Does it get any better? You bet! If you have a good V-Star to carry you there! I rolled that bike up through the mountains. The sun, and the open country was just the 'fix' I needed. When you make a decision, but then have to wait a good while for it all to happen, you can start second guessing yourself. Todays ride sure blew that crap out of my head! Just a small taste of the future and I can tell you, it tasted as sweet as anything I could imagine! 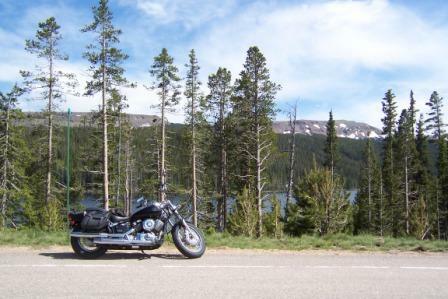 A few more miles of gorgeous country past Joe Wright, is the Continental Divide. It was a couple firsts for 'Slick' and me. The highest we've been, by a long ways, and the first time we've crossed the Great Divide together. Awsome! He ran just like he should all the way up and over 10,276' Cameron Pass. 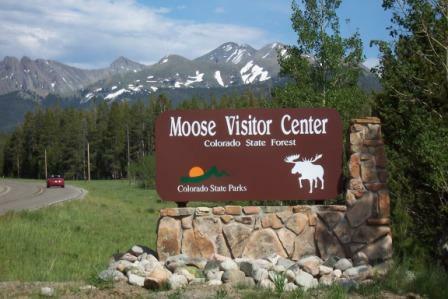 We rolled down the steep west side of the pass for a stop at the Moose Visitor Center near Gould. They have an interesting sculpture there. 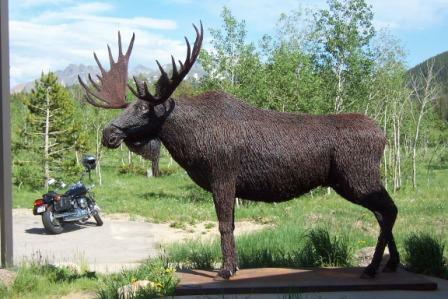 A Moose, built out of Barbed Wire! The Visitor Center had to be my turn around point. Unfortunately I had to come back to Fort Collins! But it was a sweet run. 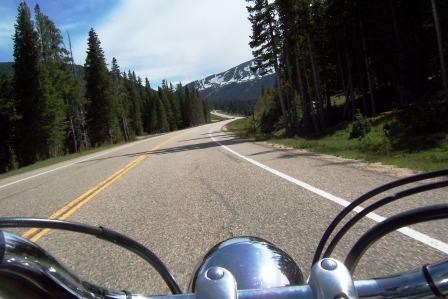 Round trip, 140 miles of some of the prettiest canyon, mountains and lake country you'll ever find. I think I'm gonna get wet... and I did. I must be twisted or just 'off', 'cause there I was, rain pouring down, I can feel the water running down my shins into my boots... and I'm giggling! I'm actually giggling! 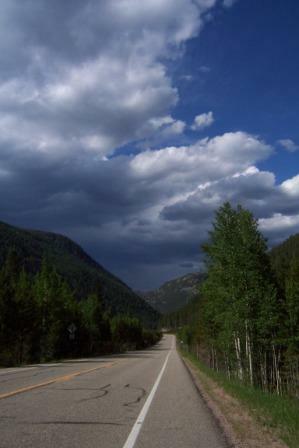 On a fine bike, in a gorgeous canyon, the air fresh and sweet smelling from the rain... I couldn't have cared less if I was wet... I was BY GOD ALIVE! I had stopped to take a picture and a Ford Powerstroke came rolling by. This poor bugger was NOT having the good day I was. It looked to be brand new... still had the temporary tags... but the noises it was makin' said something was bad wrong. Worse, that thing was throwin smoke enough to do a Navy Destroyer proud! So... after taking my own advice, and putting work aside for a bit, stopping and smelling the 'canyon' rather than the roses... I have to say I was right! 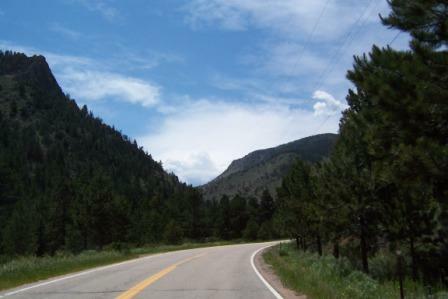 If you're running through Northern Colorado, maybe on I-25, and need a place to take a couple days rest, you might try Poudre Canyon, west of Fort Collins. I'd suggest you make your stay during the week though. 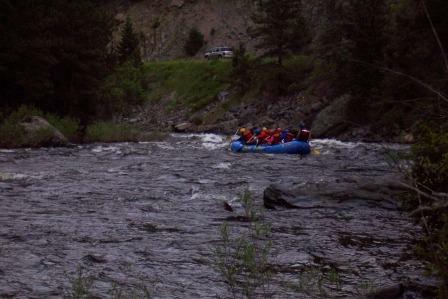 Weekends, especially in the lower canyon, it gets awful dang busy with Kayackers, rafters and fishermen. I've created a monster now for sure... I may never go back to work! Keep on wandering the back roads! 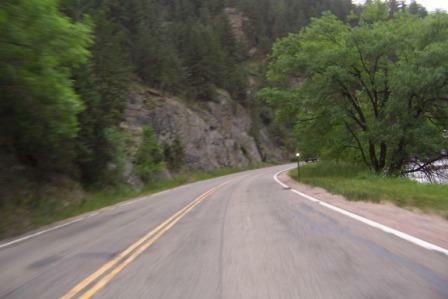 As I cruised on Slick (My V Star) through Poudre Canyon Friday I had an idea. Reaching into my pocket as I rolled along I pulled out my handy little Kodak Easy Share camera, Flipped it on with my thumb and held it up over the tank to snap a picture or two. Can I say, leaning through those bends with one hand trying to pop a picture is kind of awkward? I thought it could make some fun pics for scrapbooks.... or here! Some of them, I think, seemed to come out kind of nice!... Of course it's hard to take a bad picture in such fine country. The trick is getting the camera aimed while you are still .... 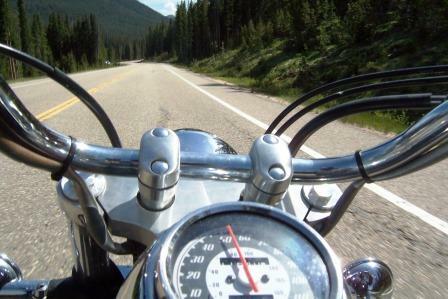 RIDING THE BIKE!... and hopefully not into a ditch! I took several pics of the headlight because I was watching where I was going, and not the camera.... seems silly don't it? Watching... where you are riding your scooter? When I had a slow moment or two I did a quick google for Handle Bar Camera Mounts... WOW! Who'd a thunk it? Quite a few hits came up... and... man them things were expensive! The lowest I saw was around $30, not too bad, while there were some up well over $200! I still figured it would be a shiny gadget to have when you are doing a motorcycle road trip... Seeing, as you already know, how I am kinda tight.... and also having a habit of 'Rube Goldberging' all sorts of gizmos... my scheming muscles started warming up. As I rattled around the nuts and bolts in the store, taking care of customers... the idea kept rattling through my head... and Bang! All the pieces fell into place. For something around $6 I found the parts to put one together! I tried it out quick when I got home tonight, and it sure looks to fit pretty well... it really is pretty clean. I have to work again tomorrow but then Tuesday I can do an actual road test and see how it functions rolling down the pavement. If it actually pans out... there will be... OF COURSE! ...a page showing what I did! So far, all it requires is a conduit clamp, a bolt, a nylock nut, a knob, a piece of hose, a can of cold soda.... and... cold soda?... hey, it was 100 degrees around here today! ....a couple minutes fiddling with the bit of hose and putting the pieces together. One last question before I sign off... If a Priest gets defrocked.... and a lawyer gets disbarred.... does a Cowboy get deranged? One hand on the throttle and the other on the camera button! 'Till next time! June 26, 2007 21:22 - Where is George? Good Deal! I hadn't thought George and Ms. Tioga were going to wander this far east... and since Rocky Mountain National Park is one of my favorite places, i't didn't need much convincing to make a try to cross trails with them today. That's one of the nice parts of being a full-timer. (Right now I think we qualify as a partial full-timers!) The ability to go where ever your nose, and your heart leads you. So what if you made other plans. When an unexpected opportunity presents itself... take advantage of it! I'd planned on testing my Rube Goldberg Handlebar Camera mount today... Oh well, that can wait a day or so! I got a late start and rolled all the way from Fort Collins to Grand Lake and back. I thought, heck, Ms. Tioga is a pretty distinctive rig. I shouldn't have any trouble finding her on the one road that runs across the park... Right?.... wrong! I had a beautiful drive through the park. But Big Red and I failed to turn up the elusive Tioga and George. When I got home tonight, I pulled up the blog and found.... DOH! 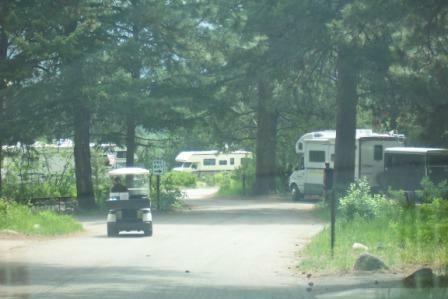 They were in Aspen Glen Campground just west of Estes park. From the time on the post, I figure they were there when I rolled past, headed west looking for them, and when I rolled back past, headed home. The sorriest part is I checked every other campground, every trail head and turn out along the way... except for THAT campground! DOH!... I'd like to say I had a good reason for not going into that one... only thing I can say is .... excessive head space! With a touch of good fortune, we may be able to meet up in the next day or so. Keeping my fingers crossed. This little trip showed some more good news about Big Red too! Heidi got back from Salt Lake, last night. When she rolled through Laramie she fueled and reset the computer. From Laramie to Fort Collins down hwy 287 she managed to squeeze out 25.1 mpg.! I took off for Estes Park this morning and after climbing up through the Big Thompson Canyon I was still averaging 23.8 mpg. Big Red and I then climbed up over the 10,500 foot Trail Ridge Road, down to Grand Lake, turning around, climbing back over the top and back down the canyon and up to Fort Collins. When we parked tonight I had pushed it back up to 24.2 mpg! We have just over 34,000 miles on the truck now and I've seen a noticeable, continued, improvement in fuel economy over the past few thousand miles. Not too bad huh? For a big heavy truck, climbing up and down the mountains, beating 24 mpg, I think, is a pretty awsome ability! That's going to be real nice for our fuel budget. I had it calculated based on 18 mpg. running empty.... I think I'll just leave it there and let there be a 'pad' in the numbers! Time for bed.... searching for George has tuckered me out! June 27, 2007 19:39 - Success!.... Yonderer Meets Vagabond! A handful of Excedrin and a couple of stout cups of coffee and I was standing a little straighter. Heidi wondered was I going to go try to Look up George and Ms Tioga again... I waffled a little but Big Red heard the conversation and demanded he get another crack at meeting Ms. Tioga. Anyway, they all convinced me to make another run at it so off we went. Shake rattle and roll. We pulled into the Aspen Glen Campground a little after 11 am. and that Big Red was shakin' an quiverin' like a preachers son on his wedding night! It was nigh on to embarrassing! Pretty quick he started squealing like a colt... "I see her I see her" and sure enough, off through the trees was the unmistakeable profile of Ms. Tioga! I'm telling you now... it's down right awkward when a fella has to tell a truck to get ahold of itself! He finally collected enough dignity so we could roll on up. Pathetic. It truly was! So I pulled up and shut the truck down and was just about to knock on the door when I heard a call... "Hello! We're over here!" And that's when the Yonderer got to meet the Master Vagabond! George was sitting over with Len Winger, next site over. If you follow Georges blog, you may already know that Len is a reader of George's blog. 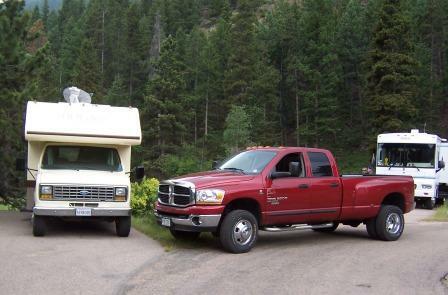 He tuned in yesterday only to find out that George was parked in the same campground.... maybe 75 feet behind him! Len has followed Ms. Tioga and George for a couple years and by a simple twist of fate, they both travelled a few thousand miles following their own trails, and ended up 75 feet apart!... and, as it turns out, Len has been following RV Boondocking the Good Life, for the past few months as well. So it was a doubly fine day for me. We shook hands all around and sat in the sun for a couple hours having a great conversation. After a bit, a couple more of Master George's disciples drove up to meet the master! :-) It really was pretty amazing. 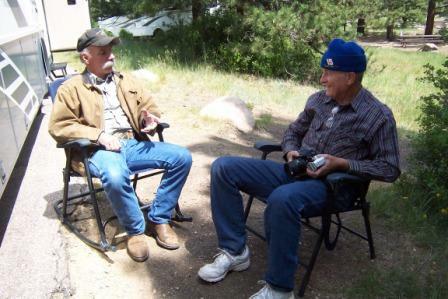 George really has become something of a legendary figure when it comes to boondocking.... I apologize for a feeble mind but the monikers of the other visitors failed to stick! I can say, the man has the humility to be worthy of every bit of reward he has earned. I am proud to consider myself a friend of his! He was a major part of the inspiration for my site and our fultiming dream... and it's growing more apparent all the time that he has made a heck of an impression on a lot of other folks as well. It was a great afternoon of conversation... though if any kids had seen it they would have likely wrote it all off as a collection of wore out ol' geezers talking trucks, tires, RVing, fiberglass, Elk and Buffalo, philosophy, and who has the biggest.... um.... horsepower! I looked up once, only to find Big Red working hard at sweet talking the Equally Legendary Ms. Tioga! My guess is she's far too worldly to get taken in by his smooth talkn' ways. Hopeful that yours was also a day to be remembered! p.s. So, I looked at George's post and he refreshed my memory. The other Visitors were Pat and Wayne with Otto the wonder dog! A wirehaired dachshund that was tying everybody up in his leash faster than we could get 'em untied! Heck, I never even ever heard of a wire haired variety. Cute little devil though! I got out of bed feeling pretty chipper this morning. Nothing like having as good a day as yesterday to have a man feeling pretty fine! Then it only got better! I have a habit of checking the site for comments or email, first thing in the morning. It's pretty nice to sit with a cup of coffee, when it's quiet, just after first light, maybe Brenn Hill soft on the stereo and catch up on the blogs I follow as well as my own site. This morning I found that George has done me another good deed! It was following his blog for a while that inspired me to start 'Goin' RV Boondocking' as well as giving us the confidence to pursue the full-time dream. Now, he's contributed to a very healthy spike in visitors to the site as well! George and Ms. Tioga are welcome at my fire ANY time! The desire to make another cruise on Slick today has gotten washed out by a couple 'housekeeping' chores not yet dealt with. First, Slick himself needs some maintenance. 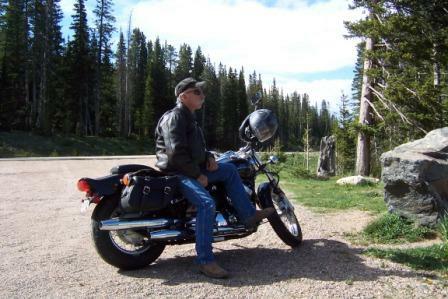 I got to looking at him the other day, after returning from the Poudre Canyon Cruise and said ... UH OH.... the front tire is 'checking' and cracking pretty badly. I know the rear tire had been replaced shortly before he came to live with me... but, apparently the front rubber has a little age on it. With the mileage that's on him now we figured it's also a pretty good time for a check up, tune up, adjust the valves etc. Me being a genuine shade tree mechanic... it's a much better thing to have a qualified mechanic look at the bike.... having something fall off, or lock up, leaning around a bend at 60 mph, makes for excitement my hide endures poorly! To check/adjust the valves the motor has to be dead cool, so I'll take Slick to the shop today, and they'll do the work tomorrow morning. We packed the 'stuff' into the shed in an all fired hurry in the scramble to get clear of the house. It's a pretty sure thing that a few items, that actually belong in the DUMP, got hauled to the wrong place. Our intention is to sort through, now that the pressure is off, find those misplaced treasures, and relocate them to their proper home in the land fill! If that's going to get done I better get to it! Shining times are here again! A few things happening in our continued March to the Mountains! As regards the sale of our house.... we passed the third of four 'outs' yesterday for the buyer to 'bail'.... the title work one... only their financing left to pass... after talking directly with their banker, we have little concern there... just the darn wait.... if you needed my patience, at this point, to float a boat... it better had be one heck of a small boat... maybe just one of those little rubber duckies! This morning, another great time sorting and culling.... again.... the wonderful junk we hauled out of the house and put in a rental shed. This just might be the toughest part of the whole trip of leaving behind a traditional house and going full-time. No matter how much a person (... ME!...) says they don't give two hoots about all their junk... it's tough to just discard it. I mean, you bought it or collected it for some reason and this world we live in 'conditions' you to place a big value on it all. But I do know that each time I have taken that deep breath, grabbed hold of that precious artifact.... and heaved it out of the back of the truck into the dump... or handed it to the new owner... whether I sold it, or gifted it, I have felt a great release. Having a bunch of collected stuff, sitting in the basement or having to pay to store boxes that ain't been opened in years, ties my liver up in a knot no Boy Scout will ever untie. But that knot has sure slipped loose from simply 'divesting'!... says something about our world don't it? Or at least it says something about me.... hmmm.... yeah.... like so tight he sqeeks when he walks! Basically at this point... unless it DOES something for us, or has some awful big sentimental value... color that sucker.... GONE! Let's see... dirty, rusty old drywall saw... hmmm.... can you guess where it went? Why was it still around in the first place?!!! Back to the sorting and culling of the.... very... last.... pile! And then, the shed will be EMPTY!... one less $BILL$ on the road to RV BOONDOCKING FREEDOM! Till We Meet again.... If you find yourself in a hole... the first thing you should do... is STOP DIGGING!